A Russian-Jewish immigrant, Kramer arrived in Britain in 1900. He studied at Leeds School of Art and briefly at the Slade School of Fine Art in London, supported by Michael Sadler, modernist collector and Vice Chancellor of Leeds University, and the Jewish Education Aid Society. 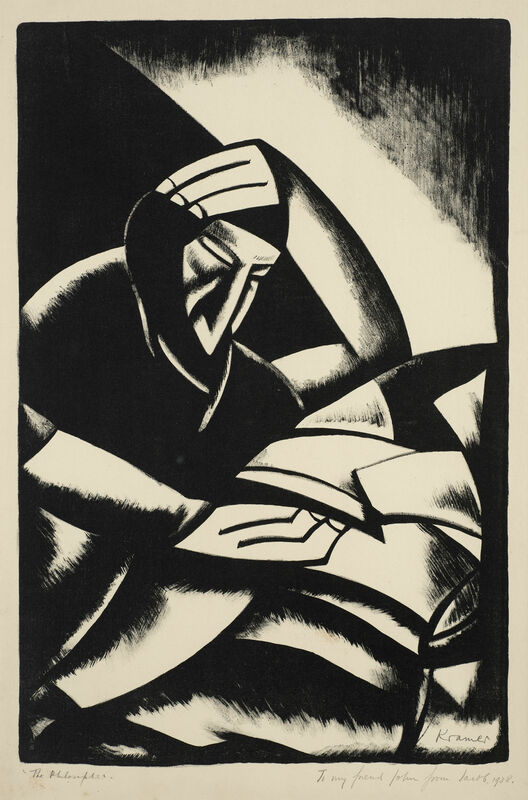 His Slade associates included ‘Whitechapel Boys’ Mark Gertler and David Bomberg, with whom he exhibited in 1914 as part of the ‘Jewish Section’ in a review of modern movements at the Whitechapel Art Gallery. During the First World War he spent a short time as a regimental librarian, a post facilitated by Herbert Read. Kramer exhibited regularly in Ben Uri's Annual Exhibition of Works by Jewish Artists from 1935–50), but, following a crisis of confidence, he returned north, eventually becoming known for his characteristic portraits of Leeds locals and notable visitors. A retrospective was held at Leeds Art Gallery in 1960. This print marks a high point of Kramer’s modernist style and is one of his most recognisable and successful images. However, the edition was never numbered or closed, enabling the artist to sign and sell copies over many years.